This new disc of piano music by Howard Blake on Decca could be seen as a survey of the composer's varied career as it not only includes recent music (his Parting, op.650a from 2013 ) and his opus 1, but also a works from different periods in his career including a group of items based on his film scores and notably, a piano piece based on Blake's most famous piece of music Walking in the Air from The Snowman. Here the music is played by the distinguished pianist Vladimir Ashkenazy (joined by his son Vovka Ashkenazy for the works for two pianists). Blake trained at the Royal Academy of Music in the 1950's studying with Howard Ferguson and finding his style of composing did not fit with the prevailing modernist ethos. He had great success as a conductor and composer going into films, but in the 1970's he turned his back on this and re-worked his style to develop his pure classical music again. As a composer Blake has never turned his back on any of his music, he has the admirable ability to incorporate the different facets of his career into one seamless whole and this disc reflects that. The disc opens with an arrangement for solo piano of Walking in the Air from the 1982 animated film The Snowman. It makes a lovely piano prelude, with Blake working the famous tune into an attractive pianistic texture. Music from the 1979 film The Changeling follows; Music Box is based on a theme written originally for a music box but developed here into a fluently attractive piece. It is not just about the big tune, as there is also plenty of finely crafted piano writing to enjoy. The final piece of film music is Laura from the 1977 film The Duellists which is a more darkly sombre character piece. The Prelude for Vova was commissioned in 2012 by Vladimir Ashkenazy (the Vova of the title) and the intention was to make a piece out of his initials, and Blake uses A-S-H (A, A flat, B natural) as the basis for this melancholy character piece whose initial restlessness develops into something quite strenuous. Speech after Long Silence was written at Ashkenazy's instigation for the 2011 Hong Kong International Piano Competition. As the name suggests, it starts from a quietly atmospheric opening and develops into something bigger. At nearly eight minutes this is one of the longest single pieces on the disc and is an impressively large-scale composition, far more complex and more full of pianistic drama than the character pieces. The Eight Character Pieces were written in 1975, again for Vladimir Ashkenazy. The eight movements follow key sequence with pairs of minor and major in a series of descending fifths, B minor, B major, E minor, E major so that the cycle ends in D major (rather neatly the relative major of B minor). A lyrically melodic Prelude leads a wistful but muscular Nocturne. The Impromptu is flowing but with a busy texture underneath (hints of Michael Nyman here, though the piece was written 18 years before Nyman score The Piano), whilst the Toccatina is a playful toccata. Mazurka has interesting rhythmic elements though I doubt you could dance to it, and the lyrical Walking song has a steady onward feel to it. Chaconne has some big dramatic piano writing over the constantly moving bass, whilst the concluding Scherzo skitters about jazz style (Blake calls it Oscar Peterson-inspired). Dances for Two Pianos was written in 1976, again we have a sequence of short movements (nine in all), each in a different dance style but as with other Blake pieces in this genre there are mischievous differences (the rhumba seven in a bar for instance) and the use of two pianos enables Blake to give us some richly imaginative textures. The work opens with the Rhumba full of delight and humour, then a Slow Ragtime which is all relaxed charm. Jump is all complex rhythms with fast accented offbeats, whilst Medium Rock is very laid back. Folk Ballad starts gentle and spare, before developing into something more complex. Boogie is a mad, up tempo jazz piece with an infectious rhythmic swing, the Jazz Waltz has a lovely melody with hints of Bill Evans, given a not uncomplicated treatment. Cha Cha is fun but not too fast, and the suite finished with a completely mad Galop. Blake's Sonata for Two Piano dates from the early 1970's, in four movements it is perhaps one of the most serious pieces on the disc, definitely not programmatic nor a character piece. The opening Allegro has some strenuous writing for the pianists, with lovely big chords, and a low key end. The quiet and spare Lento is more chromatic and less tonal than some of the music on the disc and I started to think of Bartok here. The spiky yet infectious Scherzando is playful and skittering with jazzy rhythms and 'wrong' notes'. Finally a Presto which is brisk and upfront, with the two players playing the complex textures with verve. Piano Fantasy is Blake's opus 1 dating from 1955 when the composer was 16. In it, the young composer explores oppositions of mood and texture, quiet v. loud, spare v. busy and there are some positively orgasmic climaxes. The Four Easy Pieces (from 1956) are simple but effective, quite folk-influences with spare textures. Next comes a Romana from 1963 written as a result of Blake's first meeting with Vladimir Ashkenazy (whose wife was at the Royal Academy of Music with Blake). It is a complex, romantic piece with rich harmonies. The disc finished with a pair of recent works. Haiku for Yu-Chee a lovely spare piece from 2006 written for his next door neighbour, and finally Parting a lovely little piano miniature written specially for the disc. Throughout, Vladimir Ashkenazy's playing is exemplary and he brings out the charm of the smaller pieces and rhythmic joy of the smaller pieces, whilst taking the bigger, more taxing ones in his stride. With his son Vovka, the two make a fine piano duo. This lovely disc wends its way round both Howard Blake's career and his relationship with pianist Vladimir Ashkenazy, resulting in a highly personal selection of pieces. It is also great fun to listen to and to dip into. For all the prolific output of British composer Howard Blake (born 1938), over 650 works to date, he will forever be remembered for Walking In The Air, that mega-hit song in the children’s animated Christmas film The Snowman. Its simplicity and beauty permeates most of this album of Blake’s piano music which spans from 1955 to 2013, performed no less by his close friend Vladimir Ashkenazy. The piano version of Walking, which falls easily within the hands of young pianists, is now part of Lifecycle. This suite of 24 short pieces or preludes also includes Eight Character Pieces (1975), Music Box from the movie The Changeling (1979) and the early Russian-flavoured Romanza (1963), written for the Ashkenazys after their defection to the West. Blake’s Sonata (1971) and Dances (1976) for two pianos (with Ashkenazy’s eldest son Vovka on second piano) deserve to be better known, the latter being a set of variations on a simple theme in a panoply of dance styles, including waltz, ragtime, boogie-woogie and cha-cha. The major single-movement work in this set is Speech After Long Silence (2011), written as a set-piece for the Hong Kong International Piano Competition. This is an alternatingly brooding and ecstatic essay in the manner of Rachmaninov, which perfectly suits the temperament of Russian virtuoso. An enjoyable listen, from start to end. 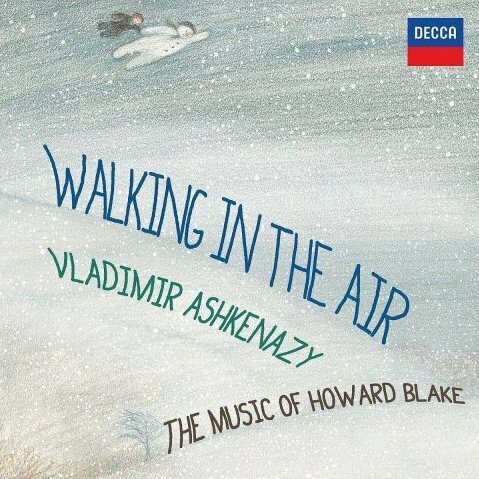 Vladimir Ashkenazy widmet sein neues Album "Walking in the Air" der Musik des britischen Komponisten Howard Blake. Die Musiker verbindet eine langjährige Freundschaft. Für beide ging mit dem Album ein lang gehegter Wunsch in Erfüllung. Der Pianist Vladimir Ashkenazy macht seit einem halben Jahrhundert als Exklusivkünstler Aufnahmen für das Label Decca und hat fast jede Facette der klassischen Klavierliteratur beleuchet. Mit seinem neuen Album beweist er, dass er nach wie vor für Überraschungen gut ist: "Walking in the Air" ist seine Hommage an den britischen Komponisten Howard Blake. Nicht weniger als neun Weltersteinspielungen beinhaltet diese Werkschau, in deren Verlauf der große Pianist das Schaffen von Howard Blake erkundet, von frühen Kompositionen aus den 1950er Jahren über Klavierstücke für Ashkenazy aus den 1970ern bis in die Gegenwart. Howard Blake hat im Verlauf seiner über 50-jährigen Laufbahn mehr als 650 klassische und populäre Werke komponiert. Mit Unterstützung des legendären Bernard Herrmann gelang es ihm, sich in den 1970er Jahren als gefragter Filmkomponist zu etablieren. Aus seiner Feder stammen unter anderem die Soundtracks für Ridley Scotts "The Duellists" und Mikes Hodges' "Flash Gordon". Mit der Filmmusik für den Zeichentrickfilm "The Snowman" und dem darin enthaltenen Stück "Walking in the Air" feierte Howard Blake 1982 den größten Erfolg seiner Karriere. Sein Klavierkonzert zum 30. Geburtstag von Prinzessin Diana, an dessen Uraufführung im Jahr 1991 er als Solist mitwirkte, verhalf ihm zu noch größerer Popularität. 1994 wurde Blake mit dem Order of the British Empire für besondere musikalische Verdienste geehrt. Neben einer Auswahl von Howard Blakes bekanntesten Filmmelodien, wie "Laura" aus "The Duellists" und "Music Box" aus dem Horror-Klassiker "The Changeling", beinhaltet das Album auch eine Reihe jüngerer Werke, die Vladimir Ashkenazy in Auftrag gegeben hat. Eines davon ist das "Prelude for Vova" (op.640). In diesem 2012 komponierten Konzertstück, das von Liszts „Präludium und Fuge über den Namen BACH“ inspiriert ist, verwendet Blake anstelle von B-A-C-H die Notenfolge A-(E)S-H als Zeichen seiner Verbundenheit mit dem Pianisten. Ebenfalls im Auftrag Ashkenazys entstand das letzte Stück des Albums "Parting" (op.650a), in dem Blake die langjährige Freundschaft in ergreifender Weise verarbeitet. Die beiden Werke für zwei Klaviere (opp.217a und 130) hat Vladimir Ashkenazy zusammen mit seinem Sohn Vovka eingespielt. Howard Blake www.howardblake.com (b. 1938) is best known for his music for the 1982 film The Snowman that includes the song Walking In The Air. Yet his compositions include concertos, oratorios, ballets, operas and many instrumental works. Blake was born in London but grew up in Brighton, Sussex. Whilst attending Brighton, Hove and Sussex Grammar School for boys he sang lead parts in Gilbert and Sullivan operettas and was recognised as a talented pianist. At the age of 18 years Blake won a scholarship to the Royal Academy of Music to study piano with Harold Craxton and composition with Howard Ferguson. Finding himself at odds with his contemporaries concerning musical style he virtually stopped composing, turning his attention to film. Blake has written numerous film scores, including The Duellists with Sir Ridley Scott and David Puttnam, which gained the Special Jury Award at the Cannes Festival in 1977, A Month in the Country with Kenneth Branagh and Colin Firth which gained him the British Film Institute Anthony Asquith Award for musical excellence in 1989, and, of course, The Snowman, which was nominated for an Oscar. Blake’s concert works include a piano concerto commissioned by the Philharmonia Orchestra for the 30th birthday of Princess Diana in 1991, a violin concerto to celebrate the centenary of the City of Leeds in 1993, a cantata to celebrate the 50th Anniversary of the United Nations in 1995 and the large-scale choral/orchestral work, Benedictus (1980). More recent works include Lifecycle – Twenty four pieces for solo piano (2003), Songs of Truth and Glory (2005), commissioned for the Three Choirs Festival, The Land of Counterpane (2007) a song-cycle to words by Robert Louis Stevenson. Howard Blake is a Fellow of the Royal Academy of Music and, in 1994, received the OBE for services to music. 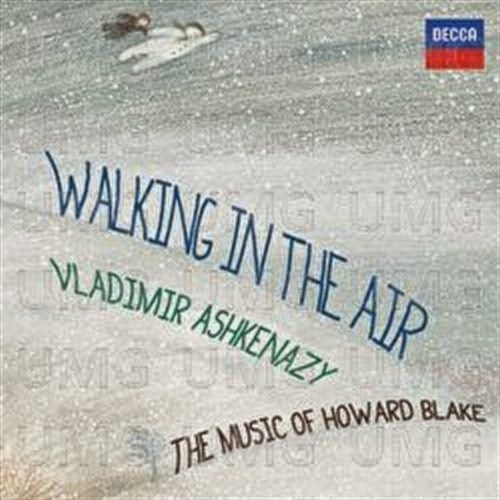 A new release from Decca www.deccaclassics.com , entitled Walking in the Air, features piano works by Blake performed by Vladimir Ashkenazy www.vladimirashkenazy.com and Vovka Ashkenazy http://musicalworld.com/artists/vovka-ashkenazy . The works on this disc give an excellent view of Blake’s work ranging in date from 1955 to 2013. The title of this new release could, at first sight, be taken to indicate a collection of lightweight pieces. However, the composer of the music for The Snowman reveals himself to be a composer of substance in some terrific pieces played superbly by Ashkenazy. What can one say about Blake’s music for The Snowman? Walking in the Air, Op.489u (1982) is a tune in a million and, as played by Vladimir Ashkenazy, has a beautiful richness of texture.There are two further film related pieces on this disc, first Music Box (from The Changeling), Op. 489n (1979) that has so many distinctive Blake features, yet with an early 20th century quality and some lovely touches from Ashkenazy. Laura (from The Duellists), Op. 604 (1977) has some surprisingly dissonant intervals that make this a very attractive piece. Written for Vladimir Ashkenazy, Prelude for Vova, Op.640 (2012) has similar features and, though relatively short, is a work of some substance that rises to a rousing climax with terrific playing from Ashkenazy. Speech After Long Silence, Op.610 (2011) is a haunting piece that rises to a number of climaxes with some rather difficult, quite unusual passages. When the main theme re-appears it is a terrific moment. Eight Character Pieces (1975) opens with a Prelude: Andantino that has Blake’s distinctive rising intervals that are instantly identifiable. This is a lovely little piece. Nocturne: Andantino sounds like a tribute to Chopin with its trills and certain intervals. For all that, it is a gorgeous piece, with Ashkenazy providing all that one could want. Impromptu: Cantabile has Ashkenazy showing his incomparable technique in playing of formidable delicacy and lightness of touch. Toccatina: Vivo, an even faster piece than the Impromptu, again shows Ashkenazy’s terrific technique in this little gem that, again, has hints of Chopin. Mazurka: Tempo di mazurka is fascinating in that, through the mazurka rhythm, one can again hear Blake’s distinctive fingerprints, those rising intervals. Walking Song: Semplice is simple, direct, yet full of character and feeling whilst the slow Chaconne in D minor: Lento has strange intervals and harmonies that slowly build in strength to a climax with superb playing from Ashkenazy particularly in the later cascading, descending passage. The final piece, Scherzo in D major: Prestissimo, hurtles forward before a slow affecting melody that is soon replaced when the prestissimo again pulls us forward at breakneck speed to a coda that returns to the slow tune. Medium Rock has a nostalgic theme, still with a rhythmic pulse and in Folk Ballad: Lento Blake develops a simple folksy theme into something more substantial. Boogie, tempo giusto is, again, great fun, full of manic humour with these pianists on fine form and enjoying themselves, Jazz Waltz is a terrific little waltz with, as the title suggests, jazz inflections, the infectious Cha-cha is given a lovely rhythmic pulse whilst the Dances conclude with a madcap Galop. Vladimir and Vovka Ashkenazy are absolutely brilliant in this work. The Allegro of Sonata for two pianos, Op.130 (1971) has a rather strident opening before the lines of the two pianos quieten and open out. There are many dramatic moments with some fabulous playing of great accuracy from Vladimir and Vovka Ashkenazy as well as moments of intense, nervous energy. The Lento brings some beautiful dissonances as the two pianists make their way through this haunting landscape, rising to a number of peaks before ending quietly. There are terrific rhythms in the Scherzando that rattles ahead with each player chasing the other. In the final Presto these pianists burst out in the opening with powerful playing before a gentler section appears that doesn’t last long. This is virtuosic music that requires players of the utmost virtuosity which is exactly what it gets here. A stunning conclusion to a work that will give a surprise to anyone expecting the Howard Blake of The Snowman. The early Piano Fantasy, Op.1 (1955) has a quiet, tranquil English atmosphere that gives way to a lively, buoyant central section before descending into the tranquillity of the opening theme. This piece is beautifully realised by Vladimir Ashkenazy. Comparing this with Blake’s later work shows that his music has lost none of his early freshness and life. Romanza, Op.489o (originally Op.5f) (1963) Andante con moto is a flowing piece that rises to a lovely climax. It is a beautiful piece full of atmosphere. Haiku for Yu-Chee, Op.567 (2006) brings a halting little theme showing how Blake can draw so much from so little. This fine collection of piano works concludes with Parting, Op.650a (2013), a brief, sad, haunting piece. I do hope that the popularity of The Snowman will not have the opposite effect of discouraging serious collectors from trying this worthwhile and attractive disc. There are some extremely fine works here that receive terrific performances. British composer Howard Blake seems to lead two careers, writing music for films and for the concert hall, yet this division is somewhat arbitrary because so much of his work has crossover appeal. The music for the 1982 film The Snowman, for example, has become one of Blake's most recognizable scores, and its signature song, Walking in the Air, has become a genuine hit, covered by pop and even heavy metal artists. Blake has also written evocative music for the films The Duellists and The Changeling, and their themes are included in this 2014 Decca release by pianist Vladimir Ashkenazy. In many instances, Blake composes in a relaxed contemporary classical style, as in the series of 24 piano pieces in Lifecycle, of which 10 are presented here, including the keyboard version of Walking in the Air. Blake is an unabashed tonalist with a pleasing lyrical gift that makes his music instantly accessible, though its mild harmonies and simple melodies are rarely challenging. However, the Dances for 2 pianos and the Sonata for 2 pianos show more rhythmically active music infused with jazz harmonies, and Ashkenazy's performances with his son, Vovka Ashkenazy, are easily the most entertaining selections of this disc.